If you are interested in the cemetery and would like to help with it's upkeep by donation or other means please contact us at sh_sixman@hotmail.com. 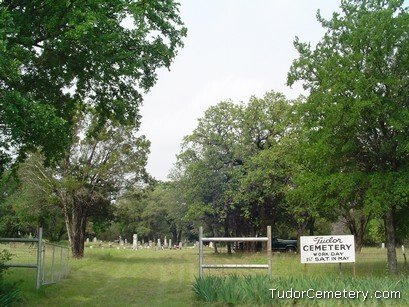 Tudor Cemetery gets its name from one of the earliest Eastland County families. Between the years of 1868 and 1872 William Daniel Tuder and his children settled the area. They made it their permanent residence around 1872. During that time a community formed and a school house was constructed near the current day cemetery location. Soon to follow in 1876 was a church known initially as the Missionary Baptist Church of Christ of the town of Prosperity. Records indicate that later the church went by the name Prosperity Baptist Church of Christ. Rev. John Lamson served as the church's first pastor. Click here to learn more about the church! During the 1870's through the 1920's local inhabitants of the Gourdneck community included, but are not limited to, following surnames: Tuder, Gailey, Wooton, Mitchell, Townzen, Kitchens, Harris, Craddock, Harmon, Guest, Bigham, Boggus, Boney, Brown, Tullos, Dobbins, Johnson, Smith, and Gipson. William Daniel Tuder's son N.F.M. Tuder officially donated the land for the cemetery in 1892, following his father's wishes that had yet to be carried out. 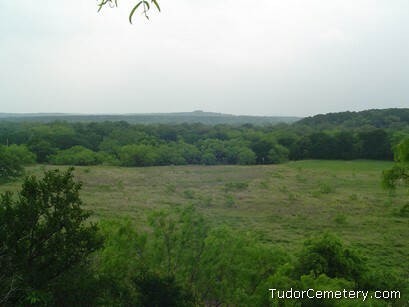 The cemetery, however, had been in existence since William Tuder's wife Sallie "S.A." Tuder passed away April 11, 1874. The current name of the cemetery, "Tudor", came years later and actually conflicts with the chosen spelling of Tuder. Of all the Tuders buried there, only one grave actually has the "Tudor" spelling, which is commonly believed to have been misspelled at the time. That particular grave is Caroline Tuder, William Daniel's 3rd wife, and is positioned at the front of the cemetery. The "or" spelling likely stuck due to the prominent placement of her grave. When Interstate 20 came through the country a formal name was needed for the road and "Tudor" was selected based on the name given to the cemetery. During a span of several years, well after most Tuder descendants had fled the area, the cemetery maintenance ceased and could have easily been lost altogether. The church building was demolished some time in the 1940's and there was little sign that there had ever been anything at that location. Through the painstaking efforts of Elmer Gailey, great-great grandson of William Daniel Tuder, the cemetery was saved and a yearly work day was established. The annual work day is held on the first Saturday in May. If you are related to the Tuders or someone buried at the cemetery, please contact us at sh_sixman@hotmail.com.